We are duh-duh-dun....duh, duh, duh-dun with sports! Until mid-August, anyway, when football practice gets cranked up (Lord, Jesus, have mercy). You've all heard me complain in the past about how living on a remote farm out in the country means you have to pack it up and haul it like a pilgrim just buy a gallon of milk. Thank goodness I was in town at the book store when my water broke with my last pregnancy. (Yay for me!) I was only 3 minutes, 14 seconds and 98 drips from the hospital. But, that's another really long story. Okay, so back to the point, which was this: the first 6 weeks of summer I lived in the car, saturating my brain with talk radio and my adrenals with coffee, shuttling kiddos back and forth (30 minutes one way, folks!) to First Tee Golf and baseball games. 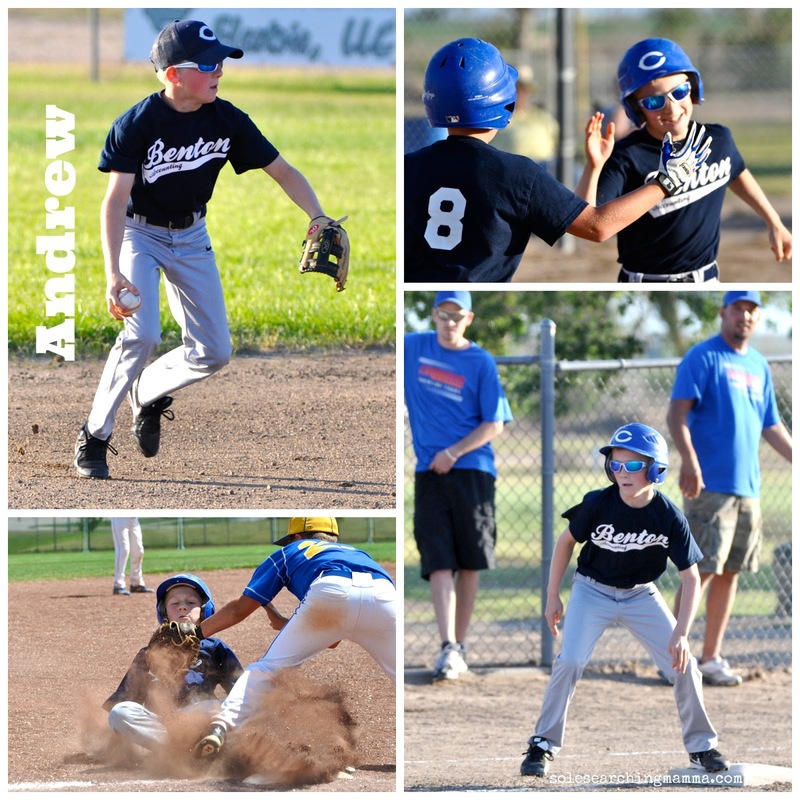 While I love to watch the boys savor the sporting life, sports aren't everything, and we all need to slow it down a bit and catch our breath. Last week, after an inspiring experience at football camp, I was hoping that the lessons the boys learned from the coaches on character, would have an immediate follow-through once we got back home. I must have been dreaming. Instead, daily duties were met with utter disdain, and sometimes left incomplete or, worse yet, completely ignored. On top of it all, sour chemistry between brothers erupting in petty arguments and uncharitable bouts of teasing left my ears ringing with irritation. I've got to blow the whistle and call time-out, okay? A post I wrote a while back on raising boys is making its way around Pinterest, but I think that it needs a follow-up post, one that is completely dedicated to boys and sports. I've written a little bit about the topic here, but have failed to make this point: You are not the water boy. What. Is. She. Talking. About?? Let me break that down for you. If you are that parent who works countless hours each week, trying to make ends meet, make a home, make decisions, make sacrifices, and make time for others, but every second of your "free time" is dedicated to chauffeuring your kids to athletic practices and events, guaranteeing that their every over-priced apparel "need" is met, the Gatorade tap never runs dry and the snack selection earns you a "mom-of-the-year" badge, there's a good chance that your kids might actually think that you're their water boy. Now, don't get all sweaty here. I'm not saying that sports are bad (obviously I'm not, since we play them year-round! ), and every kid who plays sports is bad, or that you shouldn't give all of your love and support to your little athletes. What I am saying is that it's easy to get caught up in the momentum and expectations that youth sports can demand. Practices are long, games require travel, and the cost of participating, financially and time-wise, can quickly add up. How easy it could be for our children to - without realizing it - think that we owe it to them to make this happen for them, or rather, that this is just what "normal" families do, or, worst of all, that the life of a family, the life of parents, revolves around the children. 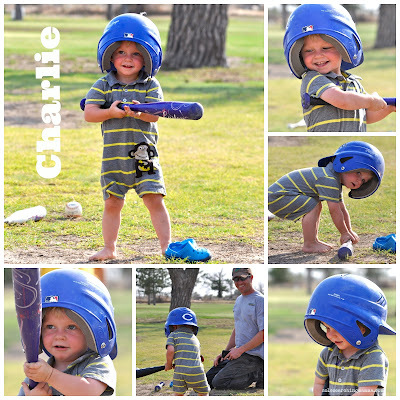 I see so many parents run ragged trying to ensure that their precious Babe Ruth has every opportunity possible to swing the bat, and look like a star doing it. Honestly, I saw so many kids at the ball diamonds last season decked out head to toe with Oakley sunglasses and Nike cleats, special gloves, glistening bats and Under Armor bags to shove all these "essentials" into. But, when the poor kids don't even know where to throw the ball, or how to steal, I begin to wonder how well a $50 pair of neon compression socks would work worn around the head. 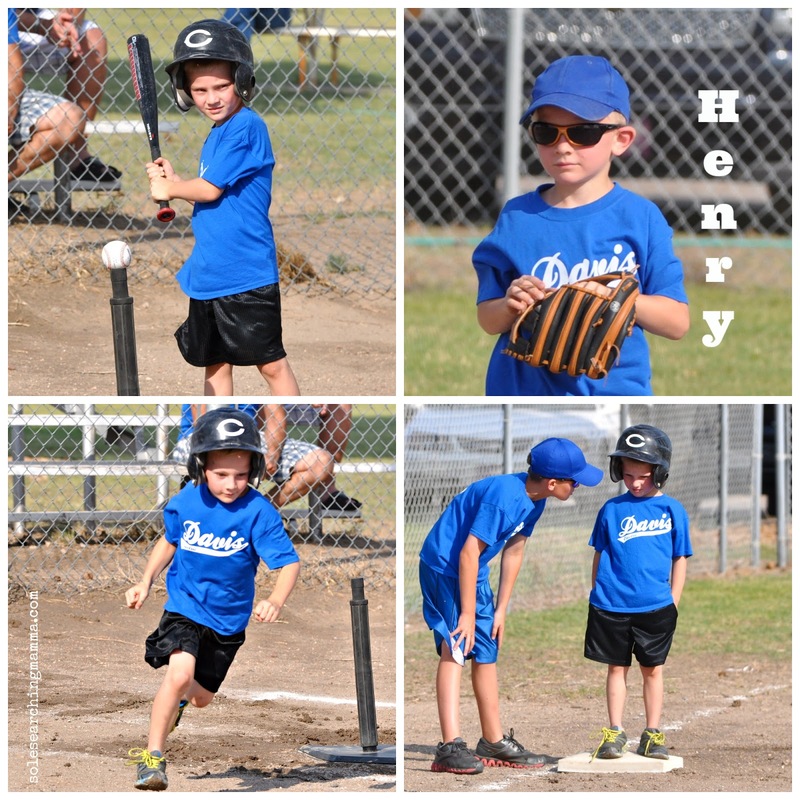 It makes me miss the Sandlot days of baseball - simple, earnest athletics. I don't want to assume these kids aren't paying for any of their get-up out of their hard-earned lawn mowing money, but if I had to guess, I'd say that parents are the ones staying up at night calculating the cost of all this attire when they should be sleeping. 2. As a parent you must be courageous enough to say no, to put a halt on all activities, if a child is not being a team-player at home FIRST. Sour attitudes, careless words, lack of gratitude, disregard for duties and disrespect towards parents in any way in our home means we don't go to practice and we don't go to games. The child who has shown a serious lack of character must then call their coach and explain why they will not be at practice or the game. The only exception to this would be if the team is short of players. In that case, it is better for the child to honor their team mates by playing in the game, but must then make amends for their behavior in some other inconvenient and uncomfortable way, such as toilet scrubbing or weed pulling. It's not cruel and unusual punishment, it's called "formation." 3. One reason kids love to play sports, is because of the competition the get to engage in and compliments they receive. Make household duties into a contest then offer some small prize for good work at the end. Also, (this is really key around here) never tire in recognizing the good that your kids do at home. They love to hear, "thank you for picking up without being asked, that was really generous of you!" or "I appreciate it when you help take care of your younger brother when I'm overwhelmed with too many tasks!" Every detailed compliment that you offer as a parent is a way of coaching the home team, and encourages your kids to be more virtuous players. 4. As for the athletic gear, I won't deny that if you enjoy sports and fitness, shopping for new gear and clothing items can really be fun - but, it can be really expensive too! I think that sports provide great avenue upon which parents can teach their children some real-life lessons about money management, the value of working toward a material goal (even if it's just a pair of Nike socks), and understanding that just as the clothes don't make the man, the accessories don't make the athlete. Our boys are blessed to have serious heave-ho farm chores to do, ones that we are happy to pay them a little here and there for. When they want something that I would NEVER buy ($15 socks and $40 slide sandals) they have to pay for them. I don't mind buying the essentials like cleats and pants, but if they want the fancy brand above my max price point, then they have to chip in. 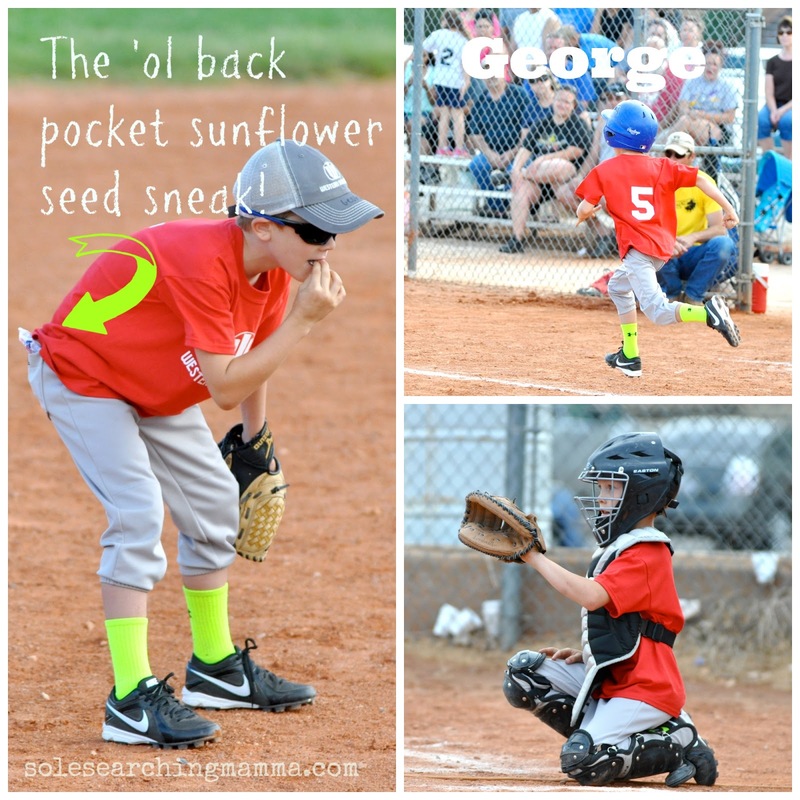 Remarkably, yet true to nature, the boys take much better care of their athletic gear when they have a financial investment of their own in it. If you're saying to yourself right now, "but, there's really nothing for my son/daughter to do that I can pay them for" then, may I ask, do you pay someone to clean your home, to dry-clean and press your work clothes, to detail your car? Are there jobs that you hate to do, like clean out the refrigerator or the garage? Make this a win-win situation, you know what I mean? And if they refuse to do the tasks or chores you request of them, you can always say, "I'm happy to take you shopping for your football cleats today, just as soon as you clean out the garage." Also, "feel free to go to the pool with your friends this week on your own dime, because I have to use the recreation funds to buy your football jersey this fall." Trust me, they won't wear last year's cleats, and since going barefoot isn't an option, I'd say you can look forward to a clean garage next time you pull in from work! 5. Finally, and probably most importantly, a successful and enjoyable journey in sports is one that is built on the principle that sports aren't just about stats, recognition, honor and popularity, but on formation of character and dedication to team. My first reaction is one of anger when I see little athletes on the bench yelling at their parents to get them more water, because the bottle they have isn't cold anymore or when the little punks throw their bag of loot at the parents after a heart-breaking loss, expecting them to carry it for them. We LET them do this! Outrage soon turns to sadness, because those kids have a rough road ahead of them. The real world isn't going to bring them cold water when they're hot and carry their crap when they can't handle the weight of disappointment on top of it all. I'm also sad for the parents of these kids, parents who are missing out on a healthy relationship with their kids, because they lack the courage and the backbone to set boundaries and have expectations of their children that will build character and confidence in their kids outside of athletic performance. We are certainly not perfect, and we've made our fair share of mistakes when it comes to raising 5 sons. 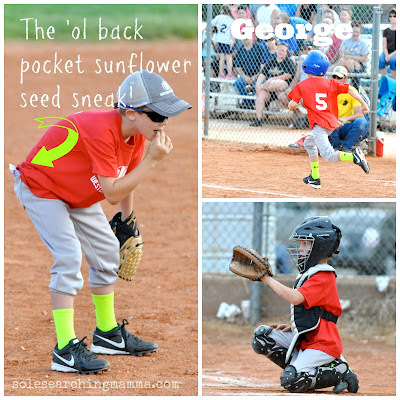 But, as our children grow, as persons and as athletes, and we all get to enjoy that growth as a family, I want to share the few tips that have helped us along the way, tips that so many wise souls have been so kind to share with us. Sports are a great avenue upon which kids can learn many valuable and important lesson about life and about themselves. 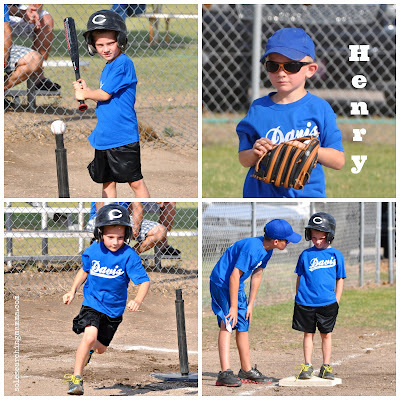 When those lessons transfer into "real life" for our children, helping them face the challenges and obstacles of the real world, that's when you've hit it out of the park as a parent. That's when you know you've been a Family team coach and not the water boy. 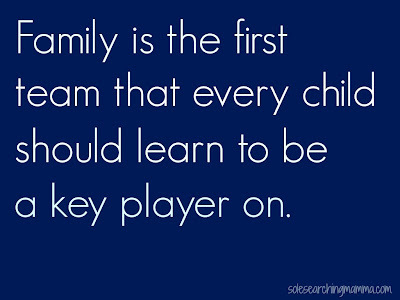 How do you balance youth sports and family life?? Please share your thoughts and/or tips with us!! 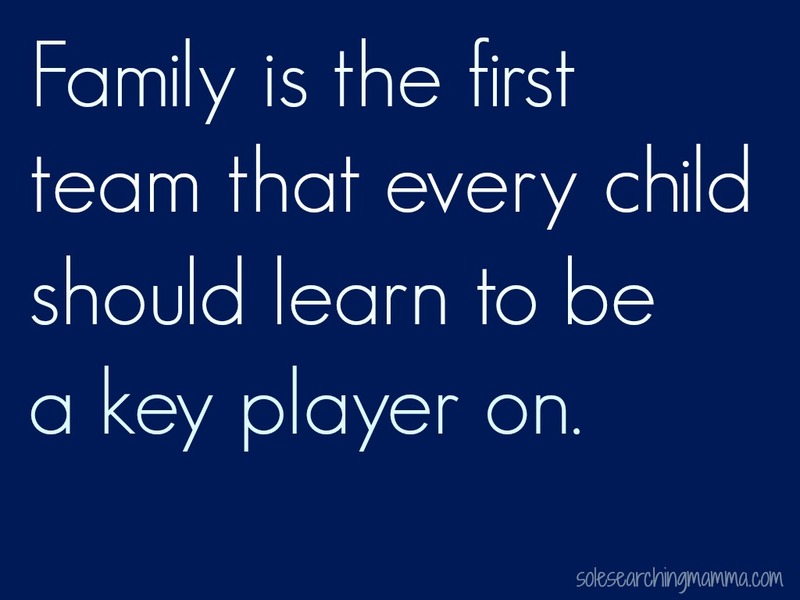 I love that quote that your family is your first team - so true!!! We have always tried to limit the # of activities that our boys can be involved in at a time - we still like to have evenings where we are all home together. One of our boys isn't really interested in ball teams and we have never forced him to participate - that would be a whoppin' for all of us!! Being home together in the evenings is precious time, isn't it?? I really think that's when the best memories are made! This is so great. Well done. We were so heavily involved in the elite youth sports track before quitting cold turkey... my mind and heart are just busting with thoughts and "Amens" as I read. I wish I could just transfer my brain to others so that they could download, return when done, and not make the same mistakes. 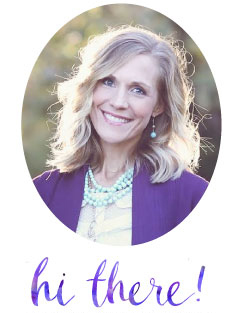 For years, we gave away our family focus and identity while covering that ugly truth with a veneer of "balance." Man, if I could have those hours and dollars back. It wasn't worthless. There was much of value... but it came at a HUGE PRICE. And we have had to HEAL. God bless and thanks for writing this! Thank you, thank you, Melody for the link!! I love it! 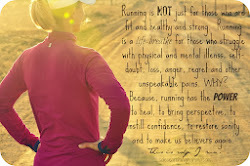 Have you read A Catholic Perspective on Sports and Exercise?? It has some great points/scripture to meditate on for families who are involved in sports. I am just thankful all I have to worry about thus far is 30 minutes worth of dance class each week!